It’s that time of year again! There’s no reason to let Back to School season bust your budget. Not only is it a great time to save while shopping, it’s also one of the best times of the year to teach kids some basic money management skills. 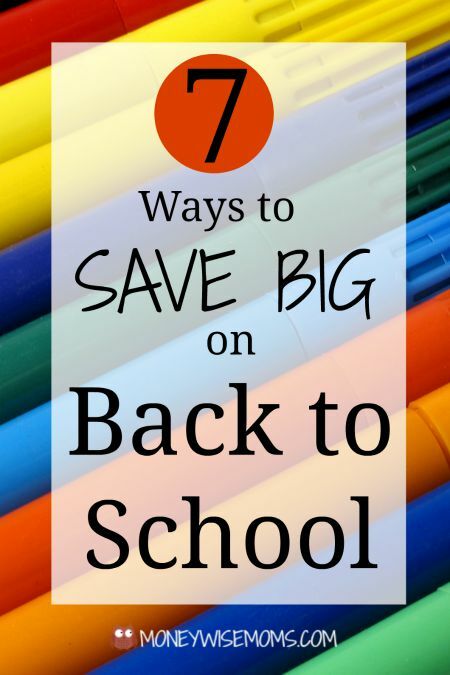 Take this opportunity to include the kids with these 7 Ways to Save Big on Back to School. Back when I was a kid, part of back to school shopping was picking out a new lunchbox and backpack every year. Was it your tradition, too? With three kids, that adds up, so we aim to reuse for as many years as we can. My son is using his black backpack for the fourth year, and it’s still in great shape. By teaching kids to take good care of their property and buying quality items to begin with, you’re setting yourself up to save money while teaching important values. My daughters were sent home in June with the contents of their desks, so we’ve gone through and found the items that can be reused this year, making our shopping list shorter and saving us money. Both? I say that because for school supplies, I’ve found that it’s best to shop early in the summer. If we wait until the week before school starts, bins of supplies are empty at the big stores, and we can’t find what we need. With clothing, however, I tend to wait and shop late. My kids can get away with shorts for the first month of school, so I wait to buy pants and jeans until late September and early October, when prices have dropped and the “hype” of back to school shopping is over. Just like a grocery store sales ad, the big office supply and other stores are trying to lure you in with the crazy-low-priced deals on the front page. Then, you pay regular price (or higher) for the other items on your list. These “loss leaders” are very effective for the stores, but you can beat them by buying only those deals and leaving. Read the fine print to see if there is a minimum purchase required and how many of each product you’re allowed to purchase. Think ahead for the year and stock up your home art center with these deals too, since these supplies will cost more mid-year. Running to multiple stores isn’t convenient, so consider asking a friend to help you divide-and-conquer. Yes, really. Up to a certain age, they’re the impulse buyers and can contribute to over-spending. You don’t have to take them with you, but it can be a great learning opportunity with a little planning. Now that mine are older (9, 9 and 11), I have them look through the weekly store flyers to find the best deals. They get a small budget and are responsible for shopping for their own basic supplies. 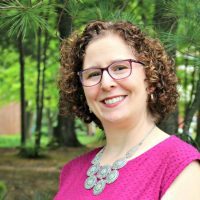 This mirrors the way we run our monthly budget at home, with entertainment and other expenses, so they’re learning first-hand how to work from a budget. I focus on wants vs. needs and how they relate to family values, which is how we’ve approached teaching money skills to our kids over the years. When they were younger, I started by having each preschooler go up to the cashier with their pennies (back when stores had 1-cent folders, pencils, etc.) so they could learn how to do a transaction, speak up to the cashier, and wait for change (all good skills to learn!). As big kids, they are capable of handling these transactions, keeping an eye on the numbers as they ring up, figuring out how many dollars to hand over, checking the change, etc. It can take a bit of time at the register, so I take them to shop at non-peak hours (early morning or mid-morning on weekdays are usually best). 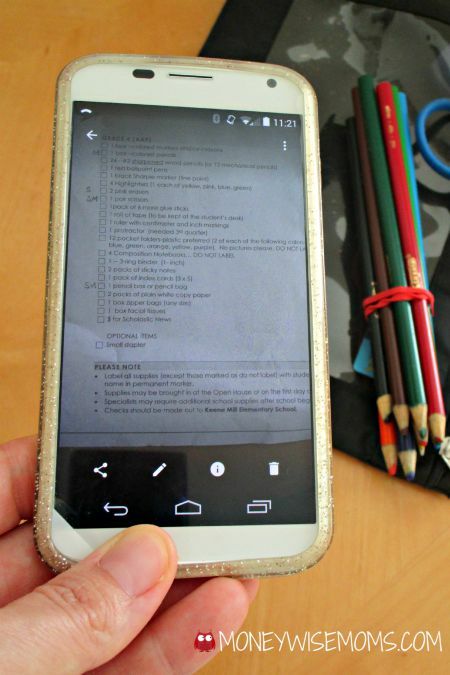 Snap a photo of each child’s school supply list with your phone so you always have it with you. Next time you’re out running errands, you can grab those couple of doorbuster deals. For clothing purchases, my kids try everything on that was packed away from the colder seasons, and we make a list of what’s needed (don’t forget socks and underwear). Then we shop from the list heading into the school year. Just like with grocery shopping, using a list keeps you from overspending and doing impulse buys. If you’re going the online route, know what things cost. 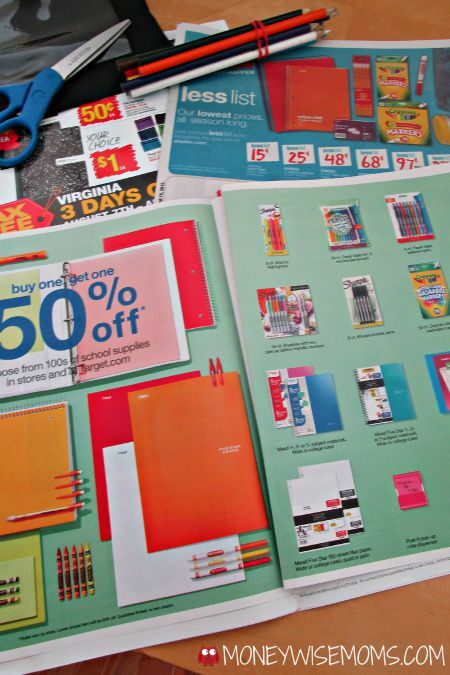 It’s easy to be won over by the convenience, but often the prices of school supplies are much higher. For clothing and shoes, be sure and use coupon codes for free shipping and %-off discounts. I buy most of my kids’ clothing online with free shipping; that way, if something doesn’t fit, it’s just one trip to the store to return it. I also know what stores & brands fit my kids and stick with those. Let the kids know that back to school shopping is just one (of many) expenses during the year, and discuss how it connects to the larger budget. My kids know that we have a monthly budget allotment for clothing and it doesn’t change just because school is starting. We also wait to buy new sneakers in late August just before school starts; the kids compare different styles, and we discuss price differences, such as why some brands cost more. For our family, budgeting money for our next vacation is high on our priority list, so we’re not willing to overspend at back to school time. This encourages the kids to help save money and gives us a family goal to work towards. Whatever your larger goal, such as saving for college, include your kids in the plan, so you’re modeling responsible financial behavior for them. 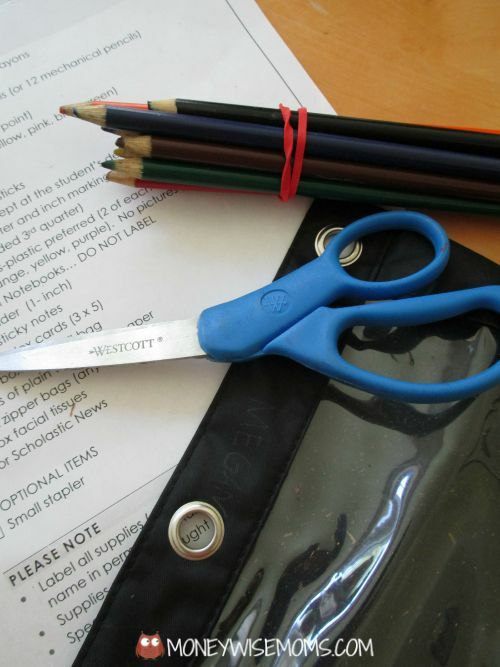 How do you teach kids about finances and saving money, especially on back to school costs? Great tips! back to school shopping is a great opportunity to save money. This is SO true! At the end of every year I will go through what’s left over and save it, especially since school supply lists seem to get longer and longer! And being able to budget is a very important skill, love your ideas! These are great tips!! Back to school can get so expensive if you’re not careful. I could not agree more. Especially with tip #1. We made the mistake of going cheap last year and it was such a waste of money. Always buy the best! I usually take the easy route when it comes to school supply shopping and just buy the prepacked ones. I do try to save supplies that are left over from each year to use at home. These are great tips. I love (and need) to save money on back to school stuff. School savings is SO necessary this time of year! LOVE this post! Oh I have definitely learned how to save and reuse supplies from the year before. There are so many times they come home with perfectly good items that I know will be on the next year’s list. I have a note 4 I write down everything in my phone for shopping. I also do a inventory list of everything I already have. I’ve been buy extra for years that I haven’t bought school supplies in two years! Great ideas! I remember once we got to middle school, we used the same bookbag for several years. We spent $50+ on it, but knew it would last.